America lost many of its brave men and women to the monstrous Second World War. 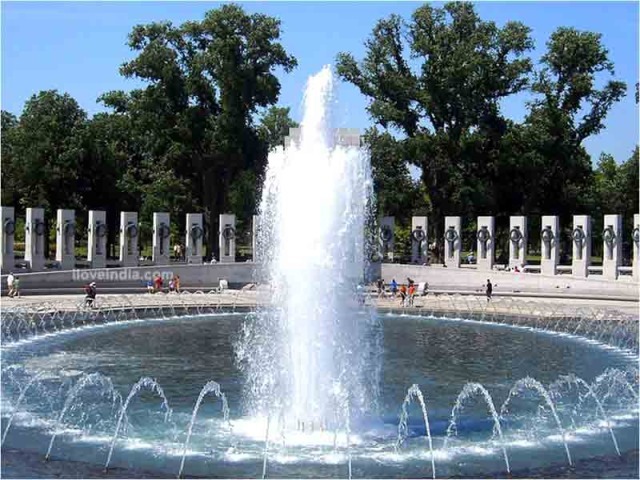 With our list of interesting facts about National World War II Memorial, explore the finer details of this monument. The Second World War was among one of the most heinous human crimes in history. Beginning with a small trigger, the battle escalated to a colossal status, engulfing the whole world and making it a bipolar place. The after-effects of the war lasted for more than five decades and the Cold War, which ended only recently, was a direct result of the Second World War. One of the countries which rose to power after the war and became a world power, henceforth, is the United States of America. America was directly involved in the war and suffered heavy losses. More than 400, 000 US citizens were killed in the war and the impact on the country’s history is very evident. To honor all those people who were killed in the events of the war, a memorial was erected and dedicated to the US citizens, two days prior to the Memorial Day in 2004. Join us as we take a closer look at the monument and tell you a few nifty things about the memorial. 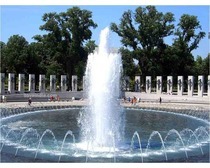 It took until 1987 for the idea of World War II memorial to be conceived. It was only when a World War II veteran Roger Durbin approached Representative Marcy Kaptur, a Democrat from Ohio, with a suggestion for such a memorial that people took notice. 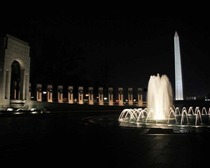 Kaptur introduced the World War II Memorial Act to the House of Representatives as HR 3742 on December 10, 1987. The bill did not pass in 1987 and neither in 1989 or 1991, when it was introduced again. It was only on March 17, 1993, that the Senate approved the act, after a third re-introduction by Kaptur. The House approved an amended version of the bill on May 4. On May 12, the Senate also approved the amended bill. The World War II Memorial Act was signed into law by President Bill Clinton on May 25 of that year, becoming Public Law 103-32. The selection of the Rainbow Pool site for the memorial was announced on October 5, 1995 by the American Battle Monuments Commission, who supervised all the affairs. A nationwide design competition was held with over 400 participants for the design of the memorial. Austrian born American, Friedrich St. Florian's design won the competition in 1997, but faced many changes through the reviews that were mandatory. As per the final design which stands today, there are 56 granite pillars, arranged in a semicircle around a plaza with two 43-foot (13 m) arches on opposite sides. Each of the 17 feet tall pillars had the name of one of the 48 states in US of 1945 as well as the District of Columbia, the Alaska Territory and Territory of Hawaii, the Commonwealth of the Philippines, Puerto Rico, Guam, American Samoa, and the U.S. Virgin Islands. The arches are named “Pacific “on the south and “Atlantic “on the north. The monument's plaza is 337 ft, 10 inches long and 240 feet, 2 inches wide. It is sunk 6 feet below grade, and contains a pool that is 246 feet 9 inches by 147 feet 8 inches. The southern side of the memorial depicts scene from war in bas relief all from the pacific theatre, whereas the north end does the same for the Atlantic theatre. Candidly, the memorial also includes an engraving typical of the Kilroy graffiti from the WWII times, which says “Kilroy was here". The Freedom Wall on the west side of the memorial has 4,048 gold stars on it, each representing 100 Americans who died in the war. The ground breaking for the memorial was done in the same September as the 9/11 attacks. Interestingly the memorial was dedicated to the public on May 29, 2004, though it was opened to the public a month before that, i.e. on April 29, 2004.